Widely distributed, common to uncommon permanent resident. Occurs in various riparian habitats, and in brush stands of most forest and shrub habitats, at low to middle elevations. Little information available on distribution and relative abundance among habitats (Grinnell et al. 1937, Schempf and White 1977). Feeding: Primarily carnivorous, eating mainly rodents (woodrats and mice) and rabbits. Also takes substantial amounts of birds and eggs, reptiles, invertebrates, fruits, nuts, and some carrion (Taylor 1954, Trapp 1978). Forages on ground, among rocks, in trees; usually near water. Cover: Hollow trees, logs, snags, cavities in talus and other rocky areas, and other recesses are used for cover. Reproduction: Nests in rock recesses, hollow trees, logs, snags, abandoned burrows, or woodrat nests. Water: Usually not found more than 1 km (0.6 mi) from permanent water. Pattern: Suitable habitat for ringtails consists of a mixture of forest and shrubland in close association with rocky areas or riparian habitats. Activity Patterns: Nocturnal; active yearlong. Home Range: In California, home ranges were estimated to vary from 44-515 ha (109-1280 ac) (Grinnel et al. 1937). Average home ranges of 20-43 ha (49-106 ac) were reported for a small number of ringtails in Texas (Toweill and Teer 1981). Also in Texas, densities of 61 km² (16/mi²) have been reported (Taylor 1954, Toweill and Teer 1981). Density estimated as high as 10.5 to 20.5/km² (27.2 to 53.1 /mi²) in Central Valley (Belluomin 1980, Poglayen-Neuwall and Toweill 1988). Territory: No information found. In Texas, home ranges of females were separated widely; home ranges of males overlapped those of females (Toweill and Teer 1981). Reproduction: Young reportedly often born in May and June (Walker et al. 1968). One litter/yr; average of 3 young, range 1-5. Gestation from 40-50 days. Females may drive males away 3-4 days prior to giving birth. Niche: Probable predators include bobcats, raccoons, foxes, and especially large owls. Trapp (1972) discussed the ringtail's adaptation to rough, broken terrain, including naked soles of feet providing traction on smooth surfaces, ability to rotate hindfeet in half circle dexterous forefeet with limited opposability of first 2 digits, and numerous behavioral adaptations. Potential competition for food exists between ringtails and many sympatric species (e.g., raccoons, gray foxes, coyotes, barn owls, great horned owls, rattlesnakes, gopher snakes). Belluomini, L. 1980. Status of the ringtail in California. Calif. Dep. Fish and Game, Nongame Wildl. Invest. 3pp. Brody, A., and D. Koch. 1981. Status of the ringtail (Bassariscus astutus) in the Geysers- Calistoga Known Geothermal Resource Area. Calif. Energy Comm. 15pp. Caras, R. 1967. North American mammals: fur-bearing animals of the United States and Canada. Meredith Press, New York. 578pp. Grinnell, J., J. S. Dixon, and J. M. Linsdale. 1937. Fur-bearing mammals of California. 2 Vols. Univ. California Press, Berkeley. 777pp. Poglayen-Neuwall, I., and D. E. Toweill. 1988. Bassariscus astutus. Mammal. Species No. 327. 8pp. Schempf, P. F., and M. White. 1977. Status of six furbearer populations in the mountains of northern California. U.S. Dep. Agric., For. Serv., San Francisco, Calif. 51pp. Taylor, W. P. 1954. Food habits and notes on life history of the ring-tailed cat in Texas. J. Mammal. 35:55-63. Toweill, D. E., and J. G. Teer. 1981. Home range and den habits of Texas ringtails (Bassariscus astutus flavus). Worldwide Furbearer Conf. Proc. II:1103-1120. Trapp, G. R. 1972. Some anatomical and behavior adaptations of ringtails, Bassariscus astutus. J. Mammal. 53:549-557. Trapp, G. R. 1978. Comparative behavioral ecology of the ringtail and gray fox in southwestern Utah. Carnivore 1:3-32. Walker, E. P., F. Warnick, and S. E. Hamlet. 1968. Mammals of the world. 2nd ed. 2 Vols. Johns Hopkins Press, Baltimore, MD. 1500pp. A cat-sized carnivore resembling a small fox with a long raccoon-like ringed tail. The long tail helps them to balance allowing them to climb nearly vertical faces in the rocky terrain they prefer. The ringtail is buff to dark brown in color with white underparts and a well defined black and white striped tail which is longer than the rest of its body. The eyes are large and black, each surrounded by a patch of light fur. Slightly smaller than a housecat, the ringtail measures 12-18 inches long with a tail of 12-18 inches, and weighs 1-1/2 to 2-1/2 lbs. 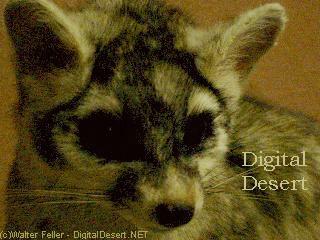 The ringtail's lifespan in the wild is about seven years. Ringtails eat a wide variety of foods; rats, mice, squirrels, cottontails, including carrion; snakes and lizards; insects, mostly grasshoppers and crickets; spiders, and scorpions; and fruits of native plants.